A hungry man is an angry man. And an angry man is a miserable traveler. Taxi drivers roam the city and dine out all the time, so they should know all the best places for finding cheap eats. If you get along well with your taxi driver, get his contact details and call him when you're hungry so he can take you there. If you want something quick and convenient, the hotel staff should be able to tell you where to go. Start conversations with locals whenever you can — it'll make for great stories and a better itinerary. For example, one time during a manicure in Bali, I learned all about the traditional Balinese naming system and where to find the best ayam betutu on the island. To get the best advice, be as specific as you can. For example, don't ask a local in Montreal where to find the best food; rather, ask her which restaurants serve the best bagel or smoked meat sandwich. And be careful with how you phrase the question. Instead of asking her where you can eat, ask her where she eats so she doesn't direct you to the popular tourist restaurants. When I went to a night market in Bangkok, there was a crowded food stall where every single seat was taken. By the time I sat down, all I knew was that they were serving some sort of noodle soup. When someone came over to take our order, I held up two fingers and pointed at whatever my neighbor was eating. I still have no idea what that noodle soup is called, but it was delicious. Eating local fare is not for everyone. And even if you're Anthony Bourdain, there's bound to be a time when you miss food from home. If you want to make sure you have access to a hearty breakfast of eggs and bacon, opt for a hotel that offers complimentary breakfast. As a bonus, eating a large breakfast could save you some money on lunch. If you plan to cook during your trip, skip the standard hotel room and go for accommodation options with kitchens instead. There are apartment hotels, vacation rentals, and even hostels with kitchens. If you share the kitchen with other people, this could even be a great opportunity for cultural exchange. Grocery shopping in a foreign destination can also be an interesting experience in itself. You may encounter a mind-boggling variety of kimchis in a Korean store or strange cheeses in a French fromagerie. Traveling is not about spending as little money as possible. There are often things you must do at your destination, no matter how much they cost. If you've always dreamed of climbing the Sydney Harbour Bridge, the price tag won't stop you. After all, you may not have the opportunity to visit again soon. Likewise, with food, sometimes there are things that are too good to pass up. If there's a Michelin-starred restaurant you've always wanted to try, do it. Just plan for the meal and budget for it. If you balance this splurge with a few cheap fares, it should be easy to stay on budget. Some restaurants have their menus and prices online, so check out the website first to estimate how much your meal will cost. If it's a particularly famous restaurant, you may be able to find reviews on foodie blogs and sites like TripAdvisor and Yelp. 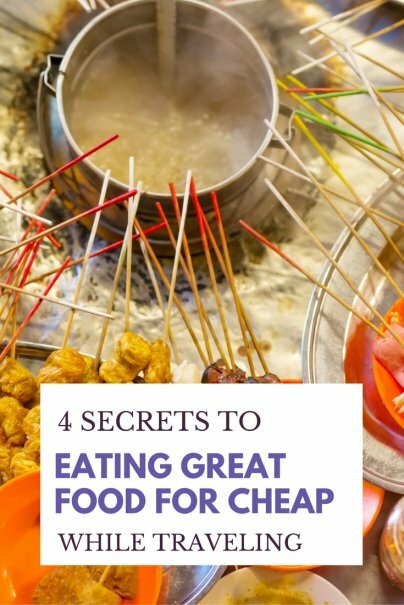 How do you save money on food while traveling? Please share in comments! There's also some great local blogs out there that will round up all happy hour deals, specials, etc. that will include all the best cheap eats in their city ;) All little research before the trip can go a long way in saving some money! We try to stop at Whole Foods, Trader Joes, or similar grocery stores while on the road. If you're careful with what you pick out, you can stock up on foods that are healthier than most vacation options and cheaper than restaurants on the highway! Obsessed with finding creative ways for regular people to afford travel.